Doll Affair is a German manufacturer of life-sized and life-like silicone love dolls. DA164 is a life-like and life-sized silicone doll by German manufacturer Doll Affair. The love doll is made of silicone and has a body height of 164 cm. The weight is 38 kg (including head). Four heads are available for the DA164 body style: Bea, Ciena, Dalina, and Lana. The head is fixed to the body. Body measurements: 86 (breast) × 67 (waist) × 98 cm (hips). DA155 is a life-like and life-sized silicone doll by German manufacturer Doll Affair. The love doll is made of silicone and has a body height of ca. 155 cm. The weight is about 26 kg (including head). Two heads are available for the DA155 body style: Nicky and Lissy. The head is fixed to the body. Body measurements: 84 (breast) × 48 (waist) × 78 cm (hips). 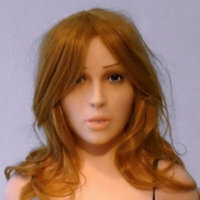 Bea is a female head for silicone love doll DA164 by Doll Affair. The head is made of silicone and carefully crafted in Germany. Ciena is a female head for silicone love doll DA164 by Doll Affair. The head is made of silicone and manually crafted in Germany. Dalina is a female head for silicone love doll DA164 by Doll Affair. The head is made of silicone and carefully crafted in Germany. Lana is a female head for silicone love doll DA164 by Doll Affair. The head is made of silicone and carefully crafted in Germany. Lissy is a female head for silicone love doll DA155 by Doll Affair. The head is made of silicone and carefully crafted in Germany. Nicky is a female head for silicone love doll DA155 by Doll Affair. The head is made of silicone and carefully crafted in Germany.